There is no better time for watching movies than Christmas. Several years ago I put together a list of my favourite Christmas movies for my students but never shared them on my blog. Finally here they are for everyone to enjoy! So get your mulled wine and blanket ready, light up your candles, your Christmas tree and start watching! Before you do I suggest a few tips on how to watch movies in general and where to watch them, they may come in handy. It’s crucial that you choose a movie you’re dying to see. This will get you through the harder scenes where the language is too difficult. Or start with those movies which you’ve already seen and loved and would love to watch again. You’ll know the plot and will be able to focus more on the language. If you are at an intermediate level or lower, watch with English subtitles. You can pause or go back and connect the sound with what’s written on the screen. You can write down interesting expressions and phrases. Slowly start watching movies without any subtitles. You’ll be surprised how much you can actually understand. You shouldn’t spend much time “learning” when watching these Christmas movies. Just turn your TV or PC on (Netflix or Ororo.tv – see more info below), kick off your shoes, put your feet up and RELAX. And don’t worry if you don’t understand everything, even native speakers don’t. Here in the article all the movies are linked through to a paid version of Ororo.tv – a movie streaming website for learners of English (and other languages). All the films are subtitled (most of them in CZ too!) and you can click on any word in the subtitles and save them, learn them and practise them. Also – you can put two sets of subtitles on, both CZ and EN, no other app does that. It is very easy to register and it is very cheap to use. I usually take advantage of their discounts and buy 2 months for the price of 1, and it costs me 3 euro per month. Normally it’s 6 euro per month, but they have cheaper packages. I highly recommend Ororo.tv, both me and my students have been using it for years. WIN 1 MONTH OF FULL ACCESS TO ORORO.TV! To be able to watch these movies at Ororo.tv, you need paid registration. I’m happy to grant you one if you email me about your favourite Christmas movie from this list by 18 December at nina@ninaenglish.cz. Which one and why? So here is my list. Can you find your favourites? Without a doubt for most people number 1 Christmas movie of the 21st century. No one since 2003 has beaten the combination and charm of Colin Firth, Hugh Grant, Liam Neeson, Alan Rickman, Emma Thompson and Keira Knightley and their intertwining stories in pre-Christmas London. British humour, genius scriptwriting and unforgettable scenes like To me you are perfect. Let´s stay in England, with Colin Firth and Hugh Grant, a little longer. Although the movie chronicles Bridget’s whole year, Christmas holiday frames the story as it starts and ends on New Year’s Day. It has one of the cheesiest final scenes in British cinematography so you shouldn’t miss this one if you want an easy, feel-good romantic comedy and British English in your ears. British countryside and the city of L.A. – two very different climates, cultures, accents and Christmas traditions. Kate Winslet, Cameron Diaz, Jude Law, Jack Black and one of my favourite romantic stories of all times. This is a must-see for every Christmas movies fan. And besides – you kill two birds with one stone as you get both British and American English here. Is this your fav scene too? Sarah Jessica Parker in a very different role than in SATC. A stiff, uptight NYC girl tries to fit in with a very chilled and liberal family governed by Diane Keaton. Watch her reserved personality melt as they grow on her, while another story unfolds in the background (warning: this is not a romantic comedy, it´s a drama). I love teaching with this movie. Another movie I’ve probably seen twenty times. It takes place in Chicago, a unique and absolutely magical city and a great setting for this movie. Christmas and all the snow suit it really well, same as this story of two people who were never supposed to fall in love. Very easy English, good old 1990’s and a nice, Hollywood-style plot. A winner. Another great movie to watch if you miss the 1990’s. And unlike other sequels, this one is one of those more successful ones.. I think it’s because of its strong message about friendship. Do you remember the part with the homeless lady who was feeding turtle doves in Central Park? If there was a bit of action in Home Alone 2, there is a lot more in this one. But as you know, this one has more than just action, just like Home Alone 2 is not just a kids movie. It’s a concert of two great action actors – Bruce Willis and Alan Rickman (here much younger and slightly less charming than in Love Actually), who are on two different sides of the barricade. One a villain, the other a “superman”. And why is this a Christmas movie? If you’ve had enough of relationship and action movies, here is a comedy for you. A drinking thief who robs department stores on Christmas Eve, pretending to be a Santa. It’s fun to watch Billy Bob Thornton in this unusual role plus I bet you didn’t remember Lauren Graham was in it! This is another great American TV classic, probably number one on American top Christmas movie lists. A very good 1980’s comedy, if you are into those. If “Family Stone” is a family drama, this is a true family comedy, with a typical American-style script and many great sketches by the main character, played by Chevy Chase. Why not enjoy Christmas the American TV style and watch this one? I cannot get enough of this movie, I watch it every single Christmas. The message it sends, not only to children, that all you need to do is BELIEVE in magic, is so powerful here. With Tom Hanks in a role we love him the most in – a wise and good-hearted man. If you have never seen it, do watch it this Christmas. It’s one of the easiest ones on the list when it comes to English, if not the easiest. A visual masterpiece by Tim Burton, the famous director of Edward Scissorhands and Batman. A dark fantasy musical which follows the story of a “Halloween Town” resident who is bored of the skeletons and monsters and decides to celebrate the holiday elsewhere. He ends up in “Christmas Town” and here you can check out the first 4 minutes of the movie. If you like musicals, cartoons, or Tim Burton, you’ll enjoy this one! You either have kids or you like cartoons yourself. 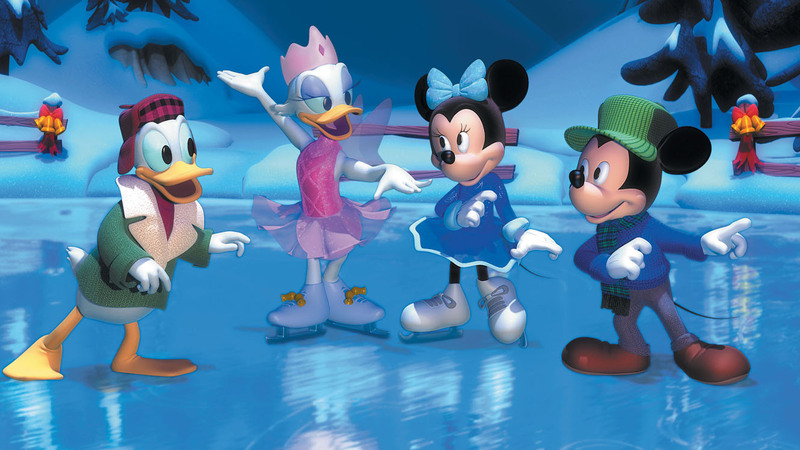 Mickey, Minnie, Donald, Pluto and others in 5 different Christmas stories. Check out the beginning of the movie here (play the video on the right). Great for watching with your kids, my daughter loves it. Nina, thanks for the perfect list!